"A great looking and interesting game where cheaters do win!" 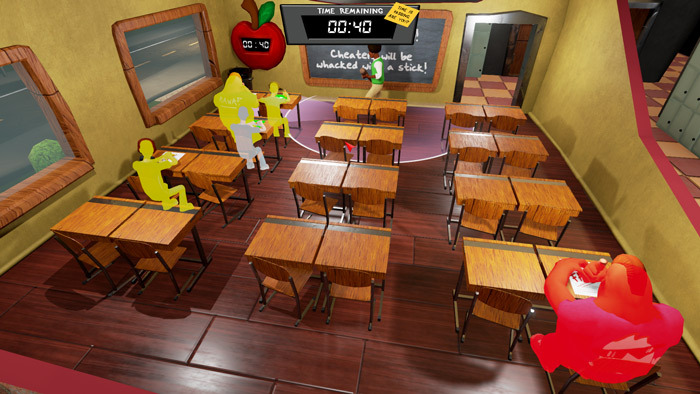 Highschool 101 is a very interesting and unique game where you have the ability to look up the answers to a test but the objective here is to get those answers to all the rest of your classmates without being spotted by your teacher, because if he does catch one of the students teaching then you will be beaten with a stick! The cartoon style graphics look really good and it’s an interesting concept for a game, the voices are also very funny when talking to your classmates or when the teacher talks as he punishes you and you can see that this is a really well made game, game play wise it’s not really the most fast paced game however it is challenging enough to give you a good amount of playing time before the repetitiveness of it starts to get too much. Highschool 101 was made for a game jam and therefore made within a limited amount of time using the unreal engine which explains why the game is quite short but there is a fantastic idea in here if only the ways to cheat were a bit more complex so that was a little more variation and things to do but it’s definitely not a bad game and there is a lot of fun to be had here. You can download Highschool 101 here for free.